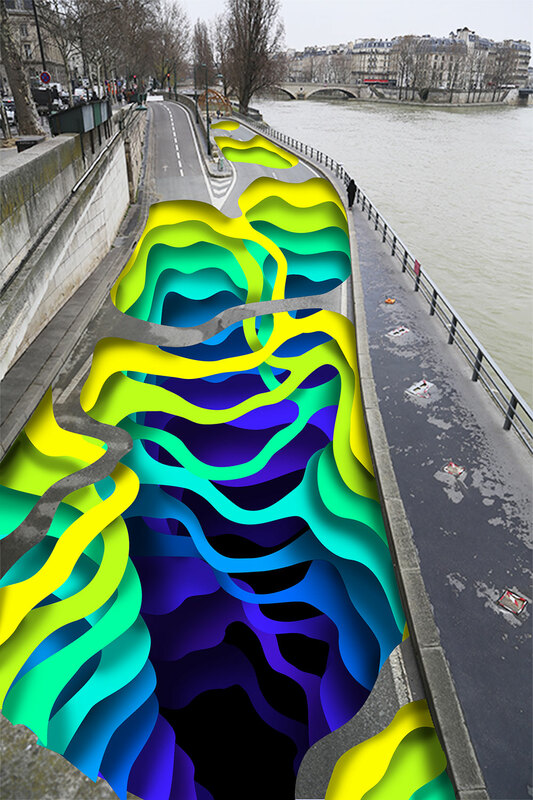 The German artist, 1010 (“tenten”) is creating a fresco on the pedestrian path along the Left Bank of the Seine. This gigantic trompe-l’œil will be two kilometers long, and will cover 18,000 square meters on the river bank. Work will last approximately three weeks. This temporary work of art will be painted entirely in watercolor. Originally from Hamburg, 1010 has been, for the past ten years, dressing city walls all over the world with his incredible trompe-l’oeil images. His brightly-colored frescoes give new life to buildings. Each work is made up of concentric circles and organic shapes of various colors that give a three-dimensional effect, bringing depth to flat surfaces. “Stream (“le courant” in French), is composed of multi-color vortices (whirlpools) that enlarge to form concentric waves which, in turn, meet and travel from bridge to bridge along the river,” explains Mehdi Ben Cheikh, who is overseeing the project. The trompe-l’œil is a type of image that challenges the viewer’s perception. Knowing that it’s a painting on a flat surface, one is nevertheless tricked on how this illusion comes into being. As such, we are encouraged to question our perceptions, and to develop our critical sensibilities. Several street artists have adapted this millennial art to the scale of the city. In 2016, a talented calligraphist, Franco-Tunisian artist eL Seed painted some fifty buildings in Cairo as part of his work entitled “Perception”. The same year, at the Louvre, JR made the famous Pyramid disappear by attaching black and white photo reproductions of the museum behind it. In the United States, the American artist, Joshua Callaghan, erased the less esthetic elements of street furniture by dressing them in images taken from the background. Come to the Left Bank between the Pont Royal and the Pont Alexander III to immerse yourself in 1010’s world! “Stream”, a project launched by the Galerie Itinerrance, in partnership with the Mairie de Paris, is sponsored by Acorus, Acorus, JEFCO, COLORIS and API’ART.